A Man Called Ove: Book Review by Dinh. On the exterior, Ove looks like an old grumpy man. His life is made of strict principles and routines. His daily routines involves inspection of the neighborhood, making sure bikes should be where bikes are suppose to be, and noting any strange or new cars around. Ove is lonely without his wife Sonja who passed away a few years back. He has no motivation to live and plans to take care of this by killing himself. One day, a young couple with 2 young children move into a house next door. Parvaneh, and the Lanky One, and their kids disrupt Ove’s life by barging in, and changing his view of his life and give him a purpose to live. This debut novel is the first book that I have read from Fredrik Backman and I love it! His other works include My Grandma Asked Me to Tell You She’s Sorry (2013), and Britt-Marie Was Here (2014). This is a fantastic book! I found A Man Called Ove to be very entertaining, comical and heartwarming. Right from the beginning it got me hooked. What I enjoyed the most about this book is the combination of the story of Ove’s life and the numerous humorous scenes dotted throughout. The book starts off with Ove trying to buy an Ipad. Ove does not have a clue about technology. You can imagine an old man like Ove in electronic store trying to buy an Ipad and just not knowing what he’s getting into. It’s comical. The beginning got me interest in Ove right away. I wanted to find out more about him and I liked how it made me laugh. I could just imagine that stereotypical scene with an older generation person trying to buy a modern gadget such as an Ipad. This chapter’s title- A Man Called Ove and a Lanky One Who Can’t Open a Window Without Falling Off a Ladder, is already catchy and you can imagine the humor in this! There are funny parts whenever Ove interacts with people. There were some great characters in this book that made the story enjoyable and believable. Although Ove is depicted as the grumpy old sod, we find that he’s not like that on the inside. Though Ove is terse and rude, we find that his past is littered with heroic action that depicts a man of courage and kindness. His action speaks volumes about his character and you begin to love this man for what he does and not his harshness. Ove is the sort of man that runs into a burning house to save someone because that’s what the right thing to do. Ove is a man that you end up liking because he has quirks. Under the strict and grumpy old man is a brave man who stands up for what is right. I particularly like the part when Ove decides the sort of man that he’s going to be. Sonja, Ove’s wife is also another great character in this book. They have a very touching story. Sonja character is the opposite to Ove’s. She likes books, cats, and dancing, and is full of life. He doesn’t like any of that. Ove is night and Sonja is day. Yet, their marriage for almost 40 years, show how much they loved each other. Ove is a man of few words so he shows Sonja how much he loves her by building a bookcase for her. When she got hurt in an accident and could no longer walk, he re-did the kitchen so she could use it in her wheelchair. I liked the way we find out about Ove’s life in bits and pieces, and how he got to be where he is. Sonja was his life. She played an important role in helping him with what he wanted to to the most in his life. Parvaneh is another character in this book that gave good insight to Ove’s interesting life. Pregnant and in need of help, she understands what Ove is like and tries to get him to be more involved in helping her and the neighbors. This was a very enjoyable read with some touching moments and some funny parts. This quirky man called Ove will pull your heart strings as you discover the man inside the grumpy exterior. You will not look at an old grumpy man the same way! I highly recommend you to read this lovely and charming book! 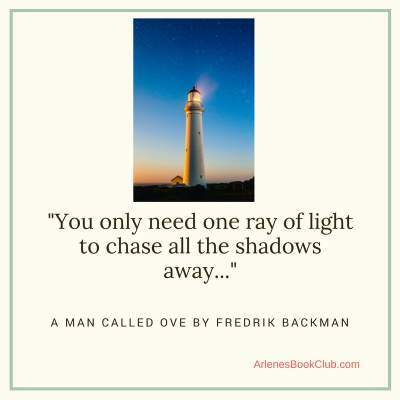 Get a copy of A Man Called Ove here. Or listen to the audio book with Amazon Audible. Have you read this book? Let me know what you thought about it! Please go to our book club discussion questions for A Man Called Ove. I have not read the book yet, but I am really considering reading it. This is the second time that someone has mentioned this particular book. I love your description of the book. I really enjoyed this book and totally recommend you to read it. I am glad that you are considering reading it. Do let me know what you think of it when you have read it. I’d be interested in your opinion on it. I really enjoyed this book as well! It reminded me of the movie “Up,” but without the balloons and the talking dogs. I loved this book too and I am happy to hear that you really enjoyed this book. It was funny, touching and uplifting in parts and what a great start for Backman! I love how in these types of stories you can really connect with the main characters. I think these really are my favorite types of books since often they are so true to life. There are many people like Ove out there. We spend our whole life in the presence and love of our spouse, and when they die it can really change a person and make them Grumpy (like Ove), but underneath they really do have good intentions. I love books that you can connect to the person and Ove is the sort of person you can understand and relate to even though he is grumpy. Death of a spouse can be crippling and especially when you’re an elder person. You can easily lose hope and faith and it’s sad to see when they don’t see a reason to live. The book does have a good ending so it wasn’t all sad- in fact it was on the whole a humorous book. Backman does a great job in incorporating sad themes and making them humorous. Humor always is a great diffuser for a sad subject such as death (when used appropriately). I suppose that’s good because then you don’t end up depressed after! I usually don’t read comical book and really enjoyed A Man Called Ove because of its humor. I will have to remedy that and start reading more books that are funny as I love a good laugh. I watch stand-up TV for my giggles usually. I agree with you that humor is fantastic to diffuse a situation. Death is a sad and scary subject and to put humor in it makes it bearable and put a different spin on it. I look forward to talking with you again! Dinh, great review of “A Man Called Ove”. While I haven’t read it, you’ve painted a beautiful landscape of Ove, and like all good protagonists, one that the reader can no-doubt relate to in some way. I work with an elderly demographic, and often we don’t ever hear of the ‘story’ or the heroic tales as you mention. Instead, we are left with a snapshot of who that person is today and perhaps little more than that. I can imagine the family moving in next door, softening the old guy up a bit and bringing him back to find some joy in his life. This sounds like a great read – I’m going to add this one to my list. I think most elderly people have a story of some sort. It just depends on what they tell you. I find the older generation has a wealth of knowledge; it’s about prying it out of them.Some stories will be more interesting than others…but we all have a past and a story to tell. Ove’s story is interesting, funny, and heartwarming and I think you will enjoy it. Books usually are better than the movie, but it’s always interesting to see how someone translates the story from paper to the big screen. I love when grumpy characters hiding a soft heart and I like that this book sends the message that you’re never too old to learn something new. Great review! I agree that books are usually better than the movie. I didn’t know that they made a movie of A Man Called Ove until I saw the trailer advertised. The trailer didn’t look that great. I’d still be interested in watching it though. This was a fantastic book. It had some great elements in that made me happy, sad and most of all it made me laugh. I commend Backman for such a good book! Awe…this ornery man is but a sweetheart inside! I’m already smiling at your description of an elderly man spinning in circles as he tries to buy an iPad! =D And, I think I would like the moments that he opens about this late wife. I’m such a sucker for love stories, Dinh. Great review! I really enjoyed reading this funny book. Backman is great in the little details which is why it’s so funny. The book is also heartwarming and uplifting. I loved how Ove ‘fell in love’ with his wife the moment he saw her. He saw in color for the first time when he saw her, his life only had meaning with her… It’s a fantastic love story. This sounds like a book I’d like to read. Just like the cliche, ‘do not judge a book by its cover’. Ove has a grumpy and rude behaviour that belies his true character. Thanks for the review! I think we all judge whether subconsciously or consciously. A Man Called Ove show’s that we can’t tell what a person is like until we get to know them and their history. Ove’s comedic life is full of commendable actions that shows a man with a heart of gold although he does not show it. Thanks for stopping by. Do let me know what you think when you get a chance to read it. I’d be interested in seeing if you enjoy this book. This story sounds interesting. In fact, it reminded me of a book by Paulo Coelho called Veronika Decides to Die. It has a powerful message and some humor. It is not appropriate for anyone younger as it speaks to adult content but is not flagrant about it. I have read it a few times and always recommend it when I can. If you love a good read and haven’t read this one yet, give it a read. I am a huge lover of books and great literature. I love this site immensely. I have bookmarked it and will return time and time again. I loved The Alchemist by Coelho and have not read Veronika Decides to Die yet. I have read some of his other works and enjoyed them too. I like the way he writes and the message in most of his books. They are very thought provoking and deep. A Man Called Ove has a simpler message of not judging a book by it’s cover and Ove’s story is heartwarming. I liked the humor in this book the most. It’s always nice when a book makes you laugh or cry or stir up any other emotions. I think this is a great review of the book! You give the plot so nicely without giving away anything 🙂 I’m curious to read this book as it sounds like my type of read. This book is great. I really enjoyed how funny this book was. Fredrik Backman is very insightful in portraying a grumpy old man who is not what he seems.